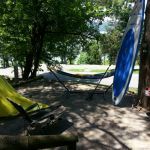 Ask fellow campers about "Floating Mill Campground COE" and nearby attractions. We have stayed at many COE parks over the past decade and were shocked at the physical layout and cramped conditions here. Motorhomes, fifth-wheels and pull-behinds are crammed in like sardines near the lake. If you have a boat and do not mind being a few feet from your neighbor in an unlevel site, then Floating Mill will meet your needs. Our reserved site (made with due diligence and reading multiple reviews), turned out to be one that cannot be safely accessed with a 42 foot motorhome. We talked to the host and were allowed to spend one night in another site-- could not level and evening power was very low: on average 105 to 107. Our surge protector shut down power once (meaning that it dropped below 104). The bathrooms are ancient and in very poor condition: rusted doors, one toilet did not work, etc. The one bright note is that the hosts were outstanding in working with us and really are clearly an asset to the park. Interesting note: the host said that the first time they came to the park as guests in their larger motorhome, they could not get into their site and left to spend the night at a truck stop. We would NEVER consider staying here again. For anyone who frequents COE parks: this is unlike any that you have seen! And, that is a shame because the lake is beautiful! We camped at Floating Mill Campground COE in a Motorhome. The lake is great for boating and the beach. We only spent one night but really enjoyed being there. Would not hesitate to return! Beautiful, clean park, wonderful view of the lake. Easy entry and exit. Would highly recommend. We camped at Floating Mill Campground COE in a Motorhome. Restroom/shower by site 91 was dirty and almost unusable, but if you walked down to end of the campground there was a newer restroom that was a lot nicer. Great views of water and nice campsites. We camped at Floating Mill Campground COE in a Tent Trailer. Supposed to use certified firewood and campground does not sell firewood. A nice COE campground for families. Tent to big rig spots. No sewer. Voltage can drop when all the units are running AC. Nice beach, boat ramp, fishing. We camped at Floating Mill Campground COE in a Fifth Wheel. Bring what you need for stay. Miles to closest store. Very pretty campground. We got a lot with a great view of the water (35) although there are many. Bathrooms were dated but very clean. Some spaces were close...and some might have been a challenge to novice campers. We will be back when we are in the area! We camped at Floating Mill Campground COE in a Travel Trailer. Very nice corp of engineers park on a large lake. Sites are oddly situated and some of the roads are a bit tight to navigate but overall a very nice park. RV sites are all paved / cement and have great electric and water hookups. 2 dump stations are available in the park. Verizon phone and data signal available but not super fast (3G). We camped at Floating Mill Campground COE in a Travel Trailer. 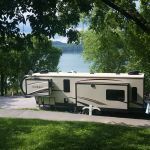 This is a great campground located on beautiful Center Hill Lake. We have camped here several times and will frequent it many times in the future. We camped at Floating Mill Campground COE in a Travel Trailer. This is an Army Corps park. It is on a hill side with some tricky turns and parking for some spots. There were some big family gatherings at some spots because of the weekend but it was quiet when needed. There were lots of kids. The swimming was ok but on a very slippery concrete slab that runs into the water. There is no WiFi and phone reception for internet was minimal. There is a clean bath house. There is a strange atmosphere and no personal touch to campground. We camped at Floating Mill Campground COE in a Motorhome. Great campground but very difficult to get out of. The exit road makes a 150 degree turn that could not be made without maneuvering in a parking area beyond the turn to get turned around. Otherwise the campground is beautiful and well maintained. We camped at Floating Mill Campground COE in a Fifth Wheel. COE campground on Center Hill Lake, Floating Mill has waterfront sites with concrete pads. These high use sites are pullthrough or back in, and sites are close together with only a few shady sites. Most sites away from water have good shade. Two or three road turns have very tight maneuvering, but even big rigs can make the turns. Sites should be reserved well in advance. No store nearby, so expect to go 5 miles or more if you have to restock the pantry. No swimming pool in campground, but there is a nice lake swim area with beach. Stayed two weeks with eight other family and friend RVers - all had sites close together - so had a great time. We would visit this campground again. We camped at Floating Mill Campground COE in a Motorhome. Are you affiliated with Floating Mill Campground COE ?